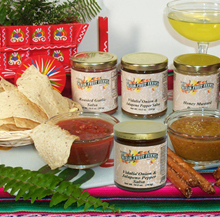 These unique salsa flavors will wake up your taste buds. Made especially for Mixons. Great with pretzels, crackers or chips, as an appetizer or snack. The Peach or Pineapple Salsa makes an attractive garnishment and enhances the flavor of your favorite fish fillet. Superb!